Part of the Navy’s decommissioned fleet sits in Suisun Bay. The USS Kawishiwi was a uniquely American ship: named for a Minnesotan river, built in a New Jersey shipyard, and commissioned in a Philadelphia Naval base, the seven million gallon oil carrier served the 7th Fleet in the Pacific for more than 30 years of the Cold War. 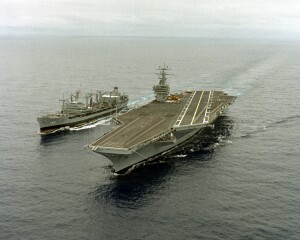 In 1979 it retired from active US duty. In 1992 it entered the Suisun Bay Reserve Fleet (one of three federal storage sites for America’s mothballing “national defense reserve” ships). And in 2011 it became available for artificial reefing. In ancient Japan, stones were rolled into the sea to provide new substrate for reefs and new homes for reef fish. Now we sink ships. In light of the ecological richness of the Bight and the potential threat a sunken fuel ship would pose to the region, the Natural Resources Defense Council (NRDC) decided to oppose the planed sinking of the former USS Kawishiwi. As members of the Environmental Protection Clinic at the Yale School of Forestry & Environmental Studies, Simi Bhat (YLS ’12) and I worked for the NRDC in this effort, researching the specifics of the vessel and the risks it posed to humans and wildlife. In addition to the hydrocarbon residues of a half-century of marine diesel fuel to be found in its tanks, the ex-USS Kawishiwi likely contains, we discovered, heavy metals (mercury, lead, barium, and cadmium) in its guidance systems, light switches, radar displays, and hull paints. Hydrocarbons and heavy metals are, respectively, carcinogens and neurotoxins. Polychlorinated Biphenols (PCBs) – carcinogenic, mutagenic, and teratogenic bioaccumulators (meaning they are passed upward in food chains) – will be found in the ship’s boiler rooms, radio rooms, engine rooms, and weapons rooms, as well as in its adhesive tapes, switchboards, insulators, capacitors, and transformers. Anything made of plastic in the ship will likely contain PCBs. If it had been sunk in California waters this year, as planned, the former USS Kawishiwi would have been the 9th such ship intentionally sunk off California, and the 5th sunk to create a reef, in the last 30 years. Though it is unclear what effect this new reef would have had on fish communities, or the dive enthusiasts who supported its creation, it is clear that any contaminants that would have survived a ship cleaning (there would have been many) would have sloughed from the ship, leeched into the ocean, and settled comfortably in the fatty tissues of marine organisms throughout the nearby water column. Eventually these contaminants would have made their way back onshore, to accumulate in the bodies of the terrestrial mammals that first commissioned them to the sea. But, as you may have guessed, the Kawishiwi was not sunk. Through a letter of complaint based on our research, sent to the Department of Transportation’s Maritime Administrator, the Natural Resources Defense Council successfully opposed the planned sinking. Through a Freedom of Information Act request we have now learned that not only will the USS Kawishiwi no longer be considered “available for reefing” but federal policy has also officially changed. 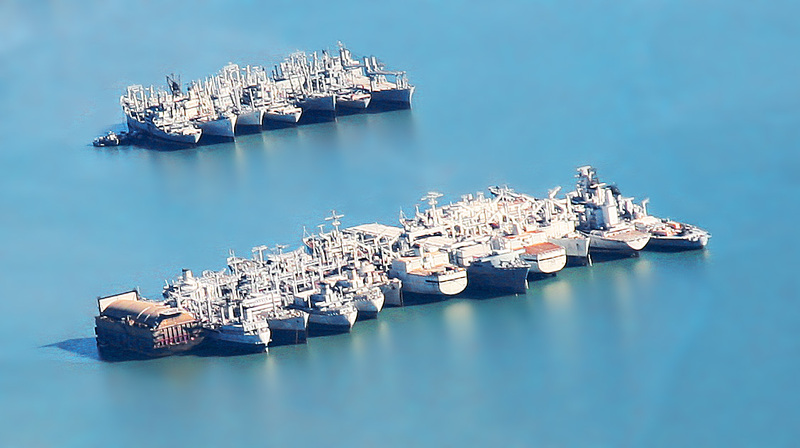 All ships owned by the Department of Transportation (there are more than 40 left in reserve) cannot be considered for reefing if they were built before 1985 (the year at which PCBs are no longer likely to be ubiquitous onboard) and will, generally, be locked into recycling plans if recycling is possible. This is a policy change guaranteed to better protect human health and the health of our oceans. But, though it is movement in the right direction, it is not nearly enough. Old, toxic naval vessels may no longer be available for use in artificial reefs, but our government is still sinking decommissioned vessels at an alarming rate. The Navy training program SINKEX, or “sinking exercise,” uses former vessels for target practice and ordinance tests. Over the last fifty years dozens of potentially contaminated vessels have been sunk in US waters under the SINKEX program. Last summer the Navy sunk three vessels off the coast of Hawaii. The Navy has plans for yet another sinking this coming fall. Is the SINKEX program worth the risks it poses to human health? Are there better ends for these ships (including recycling, which creates jobs and drives economic activity)? These are the questions at the heart of an open lawsuit against the EPA, filed by Earthjustice on behalf of a coalition of environmental groups late last year. The lawsuit demands that the agency better regulate potentially harmful ship sinks. This article is adapted from an earlier post for the Yale Center for Environmental Law & Policy on the same subject. It can be found here. Aaron Reuben is an editor-at-large and the former editor-in-chief of Sage Magazine. He holds a Masters of Environmental Management from the Yale School of Forestry & Environmental Studies, where he focused on governance of global marine resources. Aaron is a Get Out the Vote Director for Obama for America in western Pennsylvania. He is co-founder of the Brooklyn-based literary arts journal Armchair/Shotgun. Great article. A similar incident recently occurred in Australia where a decommissioned naval ship was recently scuttled off the central coast of NSW to create an artificial reef. The courts required removal of leaded components and cables containing toxic materials at a huge cost to the public but who knows what remains to leech into the ecosystem. Makes you wonder whether the benefits are worth it in the end.